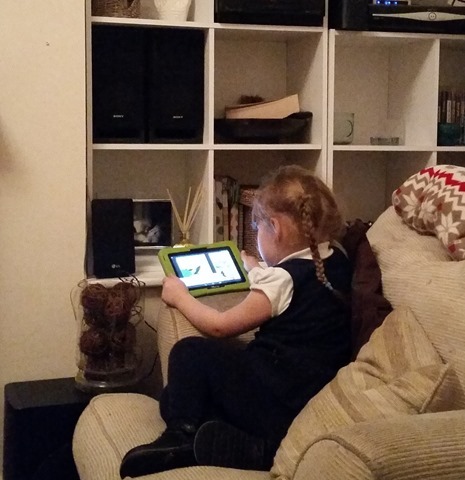 As Little Legs grows, she’s becoming more tech conscious and is getting to grips with most of our devices. Most recently she has taken a liking for Android devices which pleases us as we are big Android fans, the only downside has been that our phones and tablets are constantly in demand and after 2 broken phones and 2 broken tablets at the hands of Little Legs, you can imagine I was a little anxious to let her have free reign of our devices, particularly when it came to our laptops. She has other children’s tablets of her own, like the LeapPad Ultra and the V-Tech Innotab 3S and whilst they provide her with entertainment, she loves the apps and games available on android. 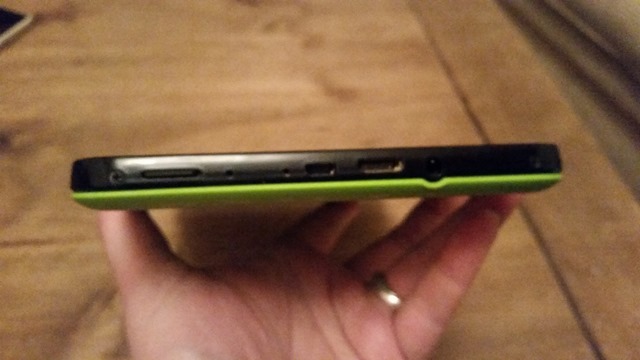 It seemed I never saw much of my Nexus 7 or Kindle Fire HD because of this. We decided that it was about time that Little Legs had a tablet of her very own and we set about research tablets specifically for children. Upon researching the Kurio 7S ticked the majority of our boxes. Just like most Android devices they are simple to set up and configure. The Kurio features a parental profile to make adjustments and control pretty much everything from Apps to internet usage. The Kurio 7S runs on Android 4.2 (Jellybean) and has a 1024 x 600 high resolution touch screen. The 7s has 8Gb of internal memory but that can be extended to 40Gb with a MicroSD card. I would certainly recommend investing in a MicroSD card as the Kurio can easily be filled up with larger apps. The Kurio connects effortlessly to Wi-Fi to allow connection to the internet. with a green bumper case which helps to protect it from clumsy little hands which are prone to bumps, falls and a general lack of spatial awareness. We opted for the 7” version rather than the 10s as Little Legs is used to the size and it’s easily manageable for her to hold and navigate without being too big or awkward to handle. Performance wise, the tablet is pretty speedy. Its a little slower to start up than say, the Nexus 7 but Isabelle has no issues with that. The Kurio has been able to keep up with Apps, there have been no slow loading apps and we have yet to find an App that the Kurio struggles with. The Kurio allows you to set up filters and block certain content, which gave us peace of mind especially since Little Legs is a big YouTube fan. I didn’t want her coming across any videos which were not age appropriate. The same with internet usage, I didn’t want her to stumble across unsavoury websites. The tablet filters websites dependant on the child’s age with separate restriction alterations to be made by the parents. You can create safe lists which are easily manages and set by parents which is great if there are certain websites that you would like to block completely. The Kurio interface is simple and easy for Little Legs to navigate, she soon picked up the touch screen gestures and swipes. The Kurio comes preinstalled with over 60 apps which meant Little Legs could get stuck in straight away. Using the parental controls on the parent account I could select which apps that Little LEgs had access to and also install and remove apps. She cannot install apps by herself so I have no need to worry about her installing expensive apps or ones that are not appropriate for her age. The one thing that I noticed when I first used the device was the lack of access to the Google Play store. This was a little disappointing as one of the main reasons we opted for the Kurio was because it was Android based and we would be able to install apps that we had already paid through Google Play. I had tried installing the APK to no avail, this resulted in the App crashing straight away. After a spot of research and a bit of messing around following tutorials I discovered that a recent Kurio update enabled the use of Google Play Store. Hurrah! We now had access to the Kurio Store, Amazon App Store and Google Play Store, all featuring an excellent range of free and paid for apps. We soon filled the Kurio with her favourite games, ebooks and apps. There are so many apps available, from educational learning apps, to fun games and even media apps, many of which are free or cost a small amount, usually considerably less than £5 even for those with popular characters such as Peppa Pig. I was happy to learn that in app purchases were not a problem as any app store purchase had to be confirmed with the parental password. One of the features that Little Legs loves it the fact that the Kurio had a front and rear facing camera, she’s been snap happy and capturing moments ever since she discovered the cameras. Combined with a photo editing app, she has hours of fun making silly faces, making videos and creating her own story boards. Now down to the battery life, I have found that we are having to charge the Kurio on a daily basis. It runs down to less than 10% each day but that is with heavy video usage and the use of the camera. We have enjoyed having our own devices back but have since discovered that Little Leg’s will happily sit and play on the tablet for hours without interacting with us at all, it can be difficult to get her attention if she is engrossed in something, very much like a teenager on a mobile phone. We easily rectified this by limiting the times she was allowed to use the tablet on the parental settings. Obviously we don’t allow our 4 year old to be left completely unattended on the internet but having the Kurio parental controls means that we can have have that little piece of mind especially when travelling that she isn’t going to stumble across something, in the dark corners of the internet that will scar her for life. So far I am completely happy with our choice, although I would have liked to see a larger internal memory than 8Gb simply because it’s very easy to fill. We did not receive this item to review nor did we receive any financial compensation. We purchased this item and simply wanted to share our views. Glad to see your little one is enjoying the Kurio 🙂 Have you used our Kids Email app yet to send e-mails? If not, I’d love to hook you up with a free account. Shoot me an e-mail and let me know.